Walking into Hemlagat is like a gentle embrace, warm and welcoming. Swedish folk art touches dot the walls, and the wood surfaces that make up most of the interior space gleam happily. If ever a restaurant looked happy to see its patrons, Hemlagat is it. 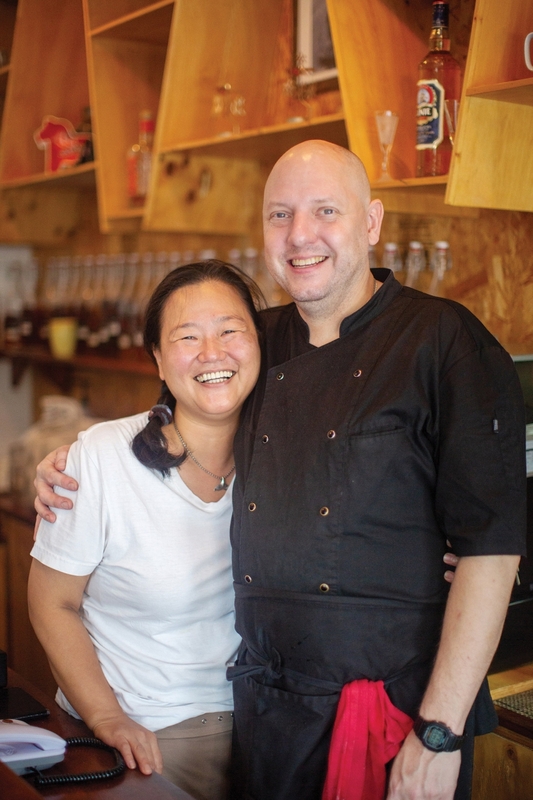 It’s a reflection of the attitude of its owners, husband and wife team of Chef Daniel Wikstrand and Soojin Oh, who started the restaurant a few years ago when they moved to Korea to be closer to Oh’s family after a globe-trotting romance. 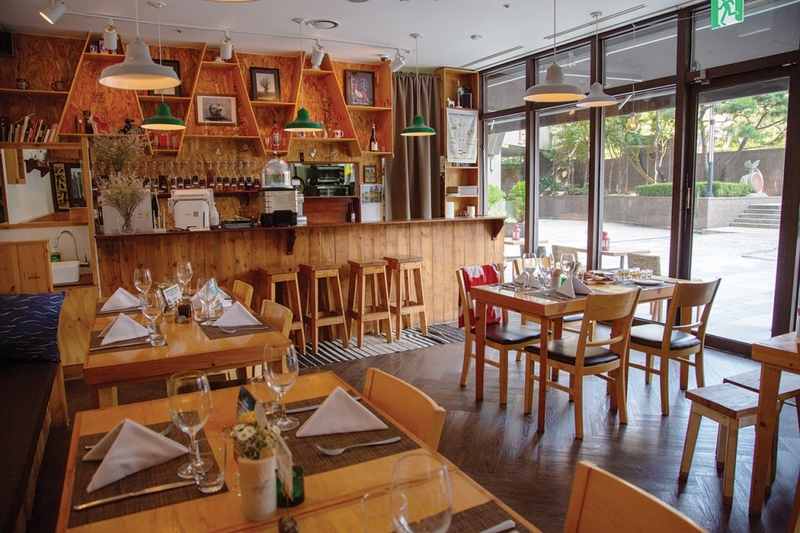 True to its name, meaning “home cooking,” the small, cozy restaurant brings the Swedish foods of Daniel’s family and homeland to Seoul, but also with an eye to what will appeal to local tastes. While not trained as a professional chef, Wikstrand’s firm vision and talents have created a wonderfully flavorful and beautiful menu of Swedish favorites, while Oh’s resourcefulness has turned ideas into reality. All the usual suspects appear, including meatballs and pickled herring, but also exciting dishes like wild game and a schnapps-laden cheese. 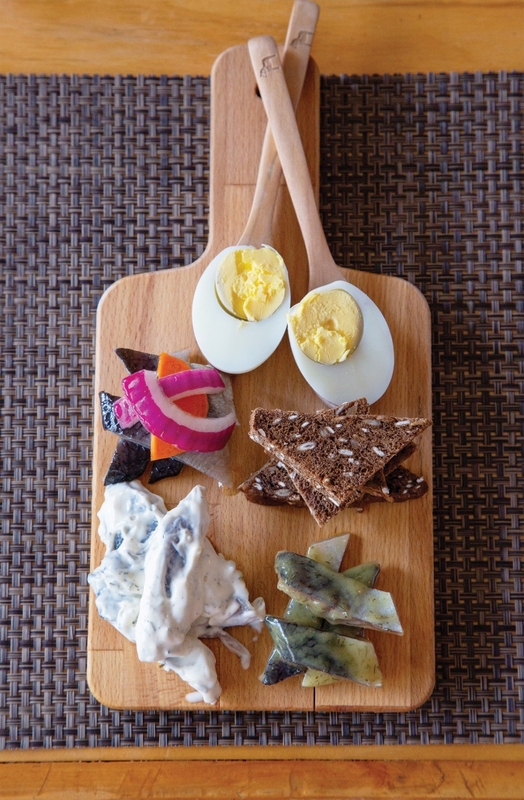 Hemlagat is serious about its pickling process, necessary to create the many varieties of traditional herring dishes that appear on the menu, including mustard and dill, and sour cream. “In Sweden, you can go ahead and order the herring pre-salted so you can flavor it any way you want. But we had so many problems sourcing good herring here! We spend two weeks salting them for the base, then a week or so marinating so it takes about three weeks total,” says Wikstrand. “We have three kinds per platter, and they vary by season. It’s all about the herbs and vegetables — onions, scallions, carrot, allspice, clove, white pepper and carraway.” The devotion to the process results in a deeply satisfying array of fish that brings to mind the Korean winter delicacy of gwamegi, a rich, chewy dish of half-dried herring. Just as bold but a little bit more off the beaten path is Hemlagat’s elk dish, served with Hasselback potatoes, mushroom cream sauce and cranberry sauce, a bit of a risk in Korea where game meats aren’t popularized yet. It took more than two years to source the elk, but the resulting dish is deeply satisfying, with crispy potatoes and creamy mushrooms playing foil to the strong, rich flavors of the elk meat. It’s the kind of traditional family fare Wikstrand and Oh want to share, bringing their love of tradition and family to the fore. Not every dish is so straightforward though. One of the menu’s lighter delights is made from chopped cheese and came from a vintage recipe book. “My parents found this Swedish cookbook from the 1950s by the Swedish version of Gordon Ramsey. He had a dish for leftover cheese by mixing it with herbs and schnapps. We said, ‘We have to try it!’ It works!” Wikstrand exclaimed. Served with crispy pork skins and house-made bread rich with different grains, the cheese dish packs a punch, with pungent cheese and bracing schnapps forming the perfect partner with the wholesome bread and brilliant snap of the pork rinds flavored with caraway and salt.